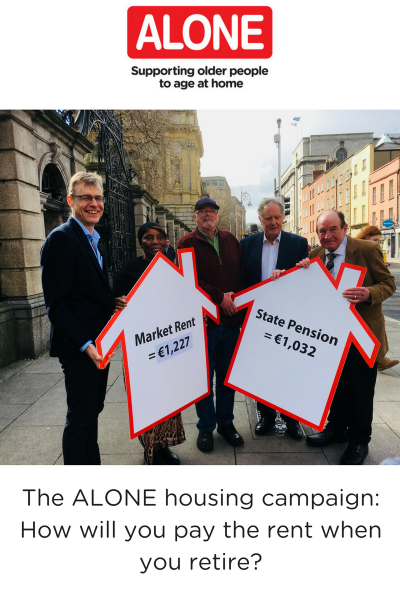 ALONE are asking the government to implement plans for our ageing demographic and commit to four key aspects that will ensure Ireland’s older population are supported to age at home with dignity. We are also asking the public to make sure their candidates will prioritise the needs of our ageing demographic if they are elected. Below is a list of our policy recommendations and you can down our full policy document below. We are calling for a Minister with sole responsibility for our rapidly ageing demographic to play one of the most important roles in the next and future governments. S/he would drive the implementation of the National Positive Ageing Strategy and ensure innovative thinking and proper planning for effective solutions and quality services. We are calling for investment in a National Infrastructure to deliver a national Support Coordination Service that is accessible to all older people to help them age at home in order to implement Goal 3 of the National Positive Ageing Strategy. Change the current CAS and calf system need to change as they are no longer fit for purpose for development of older peoples housing. Adopt the Triple Lock Pension model structure used in the UK to ensure that the old-age pension is not devalued. Read our ALONE Election Manifesto in full here. How will you pay the rent when you retire? ALONE is asking the Government to commit to six key aspects that will ensure Ireland’s older population are supported to age at home with dignity. Click below to find out more.